"The family that plays together stays together," and Hampton Beach, New Hampshire, is the perfect place for families to play in the sun and to create enduring summer vacation memories they'll share for a lifetime. Few New England beaches can rival Hampton Beach for the sheer number and variety of amusements for ocean lovers of all ages, and this state-owned beach has many advantages for families. For starters, the beach is open free to the public (although parking can be scarce and at a premium on peak summer days). The waves are tame enough so as not to intimidate toddlers, yet they roll in with enough "oomph" to keep teens and adults armed with boogie boards entertained for hours. A few years ago, Hampton Beach was one of only 35 beaches in the nation rated a superstar beach for water quality by the Natural Resources Defense Council. And this stretch of sand is watched over by devoted lifeguards. Once you're thoroughly waterlogged, there is still so much to do just steps from the beach. The west side of Ocean Boulevard is lined with all of the amusements integral to a classic beach vacation. Munch on oily fried dough coated in snowy powdered sugar. Get that temporary tattoo you've always coveted. Feast on fried seafood. Walk up to a waxy-looking fortune teller held captive in a glass box and find out what your future holds. Engage in a friendly battle for the title of "Skee Ball Champ" or "Mini Golf Pro." Don Old West garb for a family portrait session. Try to hit a 100-mile-an-hour fastball out of the park. Or simply watch the people go by. During special events, such as the annual Seafood Festival, the Master Sand Sculpting Classic Competition, and the Children's Festival, there are even more diversions to fill your days. When the sun goes down, Hampton Beach stays lively during the summer with fireworks on holidays and every Wednesday night, free concerts every single night at the Sea Shell Stage, Monday night movies on the beach and headline acts appearing at the Hampton Beach Casino Ballroom. In the winter, the throngs of bronzed bodies vanish, and Hampton Beach becomes an East Coast ghost town. Some hotels and guest houses and most restaurants and shops shutter for the cold weather season. Between Labor Day and Memorial Day, visit Hampton Beach if you're attracted to the idea of affordable, off-season rates and quiet, contemplative walks on the beach. Ocean Gaming—a charitable gaming facility with a variety of casino games and low limits—is one year-round business that lures off-season visitors to the beach. Location: Hampton Beach is located along New Hampshire's petite, 18-mile shoreline, just about 40 miles and an hour's drive north of Boston. Directions: From Boston and points south, follow I-95 North to New Hampshire exit 2 in Hampton. Bear left after the toll plaza onto Route 101 East toward Hampton and proceed 5.4 miles. Turn right onto Route 1A South/Ocean Boulevard, the "main drag" through Hampton Beach. From points north, Follow I-95 South to New Hampshire exit 2 for Route 101 in Hampton. Stay left to merge onto Route 101 East. Turn right onto Route 1A South/Ocean Boulevard, the "main drag" through Hampton Beach. Lodging: The hotels, motels and inns closest to Hampton Beach are all independently owned and operated. That means there is quite a bit of variety when it comes to quality, price and amenities. There are no hotels right on the beach—at best, you'll need to walk across Ocean Boulevard to the beach. Be sure to ask individual properties about their cancellation policies, check-in times and facilities. You'll find some more predictable chain hotels a few miles away. For VRBO or AirBnB vacation rentals, be sure to ask if linens are provided. Camping can be an affordable alternative for family vacations. Parking: Most hotels offer free parking, so if you're planning an overnight stay, it makes sense to find accommodations within walking distance of the beach. For day visitors and those staying nearby, parking can be a challenge during the peak summer season. Metered parking is available near the beach—if you can find a space. Several parking lots and private property owners charge in the $10 to $20 range to park for the day. Your best bet is to arrive early and to be prepared to pay. In the dead of winter, parking is free and easy to find, and a brisk walk on the beach will stir your senses. 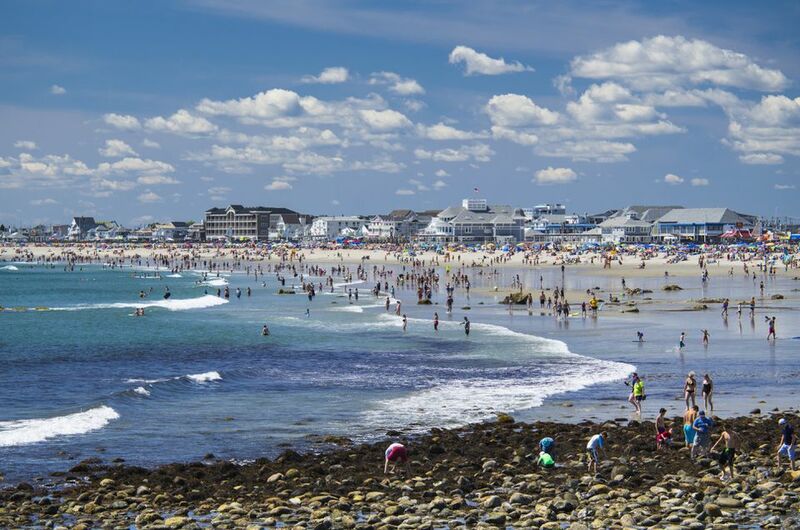 Fees: Unlike neighboring New Hampshire beaches, there is no fee to use the beach at Hampton Beach, which contributes to the crowded conditions you'll find in the summertime.